Cooking big meals for big crowds is among my favorite things to do. Making little food (appetizers, hors d’oeuvres, finger food) not so much. I think this is mainly for three reasons. One, I live with hungry men and the thought of them popping fancy little bites into their mouths by the tray load is discouraging. Two, I’m not detail oriented so making hundreds of little somethings is a bit overwhelming for me, unless those somethings are cookies. But the main reason may be as simple as not having a few great recipes that are crowd-pleasing and not too fussy. I need a dip beyond guacamole. This Buffalo chicken dip made with canned chicken or upgraded to Buffalo chicken dip made from rotisserie chicken served with celery and carrots will be a hit for my hot wings loving men. I need something beyond cheese and crackers. These mini cheese ball grape appetizer (love chevre) or these from Giada De Laurentiis may be fun to make with my eight year old. I need something crunchy. Let’s go with Crispy Brussels Sprouts with Garlic Aioli Dipping Sauce . Why haven’t I thought to serve my brussels as an appetizer before?! I need meat. More precisely, my men need meat. I place high quality frozen meatballs into a slow cooker with a fruit-based marinade like Roasted Pineapple & Habanero Sauce on high for 3 hours or until heated. 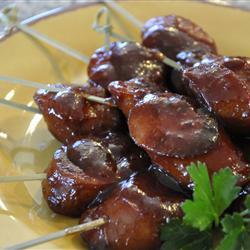 Or go with the classic Party Kielbasa pictured. What are your favorite little foods? Recipes appreciated! This entry was posted in Food, Lifestyle and tagged Celebrate, Family, Holidays, Recipe. Bookmark the permalink. I have a couple of homemade dressings – ranch and blue cheese, if you don’t have something for those already.